Soft on the inside. No image credit. Researchers in Japan have used measurements of the aftershocks of the 2011 Tohoku earthquake to gain insight into the dynamics of the Earth’s crust and upper mantle. Nozomu Takeuchi and colleagues at the University of Tokyo, Kobe University, and the Japan Agency for Marine–Earth Science and Technology, analysed the attenuation of seismic waves as they propagated through the rigid lithosphere and the less viscous asthenosphere beneath. The team found that the rate of attenuation in the lithosphere showed a marked frequency dependence, whereas in the asthenosphere the relationship was much weaker. The result demonstrates the possibility of using broadband seismic attenuation data to characterize the properties of the Earth’s subsurface. The lithosphere is the rigid outermost layer of the Earth. It comprises two compositional units – the crust and the upper mantle. The movement of individual fragments of the lithosphere (the tectonic plates) is responsible for the phenomenon of continental drift, and is possible due to the low mechanical strength of the underlying asthenosphere. 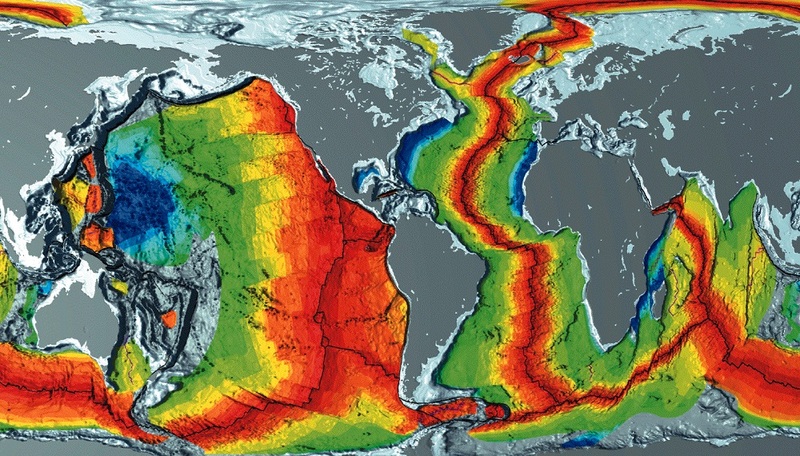 Away from the active mid-ocean ridges, the lithosphere–asthenosphere boundary (LAB) lies at least tens of kilometres below the ocean floor, making direct investigation impossible for now. The LAB is even less accessible beneath the continents, where the lithosphere can be hundreds of kilometres thick. Nevertheless, seismic wave velocities and the way the continents have rebounded after deglaciation have allowed the viscosity of the asthenosphere to be estimated even though the physical cause of the mechanical contrast between the layers remains mysterious. A rise in temperature across the boundary presumably contributes, but probably does not explain the disparity completely; partial melting and differences in water content have also been proposed. To help discriminate between these mechanisms, Takeuchi and collaborators looked to differences in the attenuating effects of the lithosphere and asthenosphere. This is a promising approach, because the process of anelastic attenuation is closely related to a material’s thermomechanical properties. The situation is complicated, however, by the fact that high-frequency seismic waves are also attenuated by scattering from small-scale features, and low-frequency waves are attenuated by geometrical spreading. Using a dataset obtained after the 2011 earthquake by an array of ocean-floor seismometers in the northwest Pacific, the group compared actual records of seismic waves with a series of probabilistic models. To isolate the anelastic attenuation signature for high-frequency (>3 Hz) waves, the researchers conducted simulations in which the scattering properties of the lithosphere and asthenosphere were varied. The model that most closely matched observations indicated a rate of attenuation for the asthenosphere 50 times that for the lithosphere, and suggested that this attenuation is not related to frequency. Seismic waves in the lithosphere, in contrast, seem strongly frequency dependent. Although Takeuchi and colleagues’ research shows that seismic-wave attenuation studies have great potential to add knowledge in this field, the results themselves do not immediately support one model over another. Laboratory experiments reveal that partial melting of a sample can produce a weak frequency dependence similar to that determined by this study for the asthenosphere, which on its own would strongly suggest that as the reason for the layer’s low viscosity. However, a similar effect has been observed for samples below the material’s solidus, undermining that explanation somewhat, and also failing to explain why the same response is not observed in the solid lithosphere. Further experiments involving additional factors will be needed to settle the issue. Full details of the research are published in Science. A commentary on the research, written by Colleen Dalton of Brown University in the US, is also published in the same issue.